It was a milestone night yet again for Valley senior Sophie Bussard. 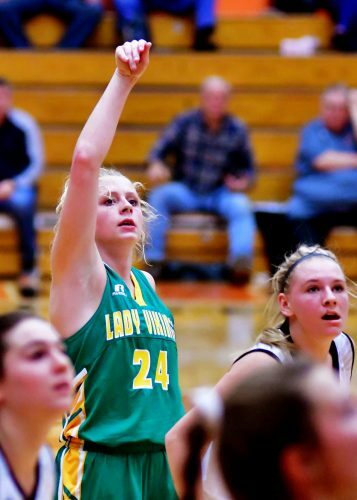 After a volleyball campaign that had Bussard leave as the all-time leading scorer, Bussard etched her name Wednesday in Valley basketball lore by scoring her 1,000th point in the win over Triton. With her 13th point against the Trojans in the third quarter, Bussard became just the sixth player in Valley basketball history to reach the milestone, and also passed Kara Kramer for fifth on the all-time scoring list. Bussard ended with 20 points, giving her 1,007 for her career to date, Kramer ending with 1,006 in 2005. Bussard wasn’t just a scorer Wednesday, adding 10 rebounds, eight steals and four assists. Valley made the game elementary in the first quarter, storming out to an 18-6 lead and holding Triton to 10 points in the first half while taking a 23-point lead into the break. Jillian Walls added 13 points on the strength of four three-pointers and Makenzie Woodcox added nine points. Stats for Triton were not provided. Valley (7-3) will host North Miami Friday while Triton (2-10) visits Caston Saturday night. Warsaw poured it on in the second half to pull away from Fort Wayne Carroll at the Tiger Den. Warsaw went on a 14-3 run in the third quarter, spreading out what was a four-point lead at 22-18 at one point in the first half. Warsaw held the Chargers to just six points in the second half for an impressive non-conference win. Warsaw had Abby Sanner take the lead in scoring with 13 points and added another eight rebounds and two steals to the mix. Brielle Harrison had 10 points and two blocks, Kaylee Patton hit a big shot during the run and had eight points and four steals and Maddie Ryman also had presence in the run and scored seven points, five rebounds and four assists. Emily Parrett paced Carroll with seven points. Adin Um led Warsaw with 11 points and Bailie Stephens had nine points to lead Warsaw to a 35-26 JV win over Carroll. In the freshman game, Warsaw triumphed 36-19 over Carroll. Warsaw (7-4) will open Northern Lakes Conference play Saturday at home against Plymouth. Brooke Sugg keyed Grace’s women’s basketball team to its third straight victory, beating Goshen 77-65 on the road Wednesday. Sugg scored a game-high 33 points, her third-straight game of at least 30 points. Sugg, the reigning Crossroads League Player of the Week, hit four 3-pointers and was 9-of-9 from the foul line for the Lady Lancers (8-5, 3-1 CL). Grace’s pressure blitzed the Maple Leafs (6-6, 0-4 CL) from the opening tip. Kyannah Stull buried a 3-pointer to start the scoring, and Grace went on to score 14 straight points to start the game. Sugg had seven points during that spurt. The Maple Leafs were stifled into six turnovers in the first quarter and did not score a point for the first 5:52 of the quarter. Sugg beat the buzzer with a shot for the final score of the quarter, and the Lady Lancers led 18-8 after one period. Goshen rallied with a 10-0 run early in the second quarter to cut Grace’s lead to two. But the Lady Lancers countered with a 13-1 run of their own to re-establish a double-digit lead. Grace held a 40-28 edge at halftime thanks to 17 points from Sugg and six from Stull. Goshen refused to fade, however, and defensively held Grace to 14 points in the third quarter. The Maple Leafs slowly whittled down Grace’s cushion, and Goshen trailed just 54-50 with nine minutes remaining in the contest. But Grace reacted calmly, scoring seven straight points to eliminate Goshen’s immediate threat. Kaylie Warble scored three quick points to start Grace’s run. The Lady Lancers managed to hold off Goshen for the rest of the fourth quarter, and Sugg hit four foul shots in the final minute for the final 12-point margin of victory. Grace only committed 12 turnovers, including just four turnovers after halftime. Goshen, on the other hand, was forced into 22 turnovers. For the game Grace struggled with its shooting touch by making 39 percent from the floor and 27 percent from beyond the arc. But the Lady Lancers got to the foul line 25 times and made 20 of their chances. Stull had a balanced statline with 10 points, 7 rebounds, 2 assists and 2 steals. Kamryn Hostetler had 8 points, 6 assists and 2 steals, and Warble added seven points and eight boards. Vironnica Drake tallied 6 points, 6 rebounds, 4 steals and 2 assists, and Pam Miller produced eight points and two rebounds. The Lady Lancers are on the road again on Saturday, playing at No. 24 Huntington at 1 p.m.
A career night from Haden Deaton lifted Grace’s men’s basketball team to an 83-74 victory at Goshen on Wednesday. Deaton ripped off a career-best 33 points and nine rebounds, scoring 21 points in the second half to power Grace’s road win. The first half was tightly contested as neither side was able to gain a significant edge. The lead changed hands 10 times in the first half alone. The Maple Leafs (1-10, 0-4 Crossroads League) scored eight straight points midway into the half to open up a 28-21 lead. Three minutes later, Grace echoed Goshen’s spurt with another 8-0 run thanks to four points from Logan Godfrey. Goshen scored in the final seconds of the half, claiming a slight 39-38 lead as the teams entered their halftime locker rooms. Both sides shot at least 50 percent from the floor, but the Lancers (9-3, 1-3 CL) made just 7-of-16 (44 percent) from the free throw stripe. In the second half, Goshen reasserted another seven-point advantage in the opening minutes. But Deaton scored seven straight points for Grace to eat away at Goshen’s lead. With six minutes to play, Grace faced a one-point deficit. But Deaton stepped up again with a pair of big shots, burying a 3-pointer on back-to-back plays to hand momentum back to Grace. After a steal from Braxton Linville, Grace set up a backdoor play. Linville made a pass to Deaton, and Deaton rose up for a two-handed dunk for his eighth straight point. Deaton’s dunk put the Lancers on top by five, and Logan Godfrey followed that up with two free throws for a 75-68 lead with 3:21 remaining. Defensively, Grace made enough stops over the final minutes to withstand a potential comeback. Linville and Charlie Warner connected on six free throws over the last minute to ice the victory. Deaton’s 33 points came after hitting all three of his 3-pointers. Godfrey just missed a double-double with 19 points on 7-of-8 shooting, adding nine rebounds in 24 minutes before fouling out. Warner tallied 14 points with seven rebounds, Linville amassed 8 points, 7 assists, 7 rebounds and 3 steals, and Eddie Gill IV chipped in five points and three rebounds. As a team Grace had nine assists on 18 turnovers, but the Lancers outrebounded Goshen 43-24. Grace also got to the free throw line 39 times compared to 18 foul shots for the Maple Leafs. The Lancers remain on the road Saturday, playing at Huntington at 3 p.m.
Nolan Cumberland led the Vikings with 14 points. Caden Miller paced the Squires with nine points and five rebounds. Garrett Sites paced Manchester with 14 points and teammates Gavin Martin had 12 points and Coleman Sulkey ended with 11 points and six boards. Landon Durkes again led the Vikings with 11 points.